I don't drive as much as the average American. I've put about 50,000 miles on my car in the past 6.5 years so that averages out to only about 8,000 miles a year. I believe the typical American drivers more like 14,000 miles a year. Id' assume that driving to work and back is a big reason people put miles on their cars. But where else do they log all those miles? I found 2009 data in a Summary of Travel Trends 2009 National Household Travel Survey document from the DoT. 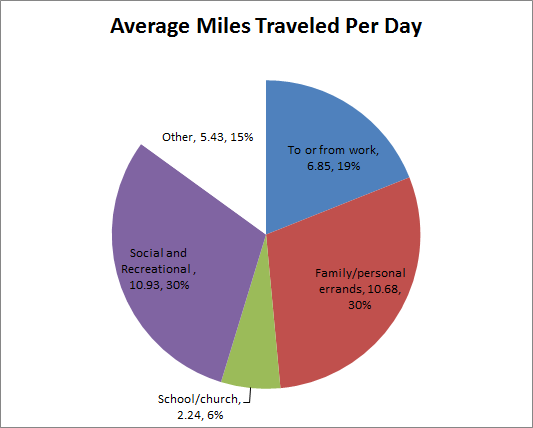 I'm actually surprised that commuting for work is only at 19% of the total. But I guess I shouldn't be too surprised. That would equate to about a 10 mile round trip commute for most people. What do Carbon Offets Cost? Whats The Cheapest Car to Drive? How Do Parents Spend Their Time?